Our Sennheiser HD 598 Review - Are These Headphones Legit? / Our Sennheiser HD 598 Review – Are These Headphones Legit? With all the trendy, gaudy and edgy headphones on the market, there has to be a sizeable proportion of audiophiles but off by the youth-focused designs. If that’s the case, Sennheiser has you covered with its HD 598 model that offers a stylish and sophisticated look while allowing you to listen to every nuance in your favourite music or movie. Unfortunately, the Sennheiser marketing team has missed out using models with turtleneck jumpers, smoking a cigar and listening to the best of Burt Bacharach to promote, these but that’s the first impression they give us. Another key feature of these headphones is that they are designed to be repaired, not just tossed away when the plastic cracks, as is often the case with many other brands. Most parts are replaceable to help keep the music coming. They’ve also been on the market for a few years, raking in the positive reviews and proving their worth to audiophiles around the world. In this review we are looking at both style and design, audio quality, usability and price. Let us know in the comments of your experiences with these HD 598s and how they compare to your previous or newer headphones. Designed for comfort, the 598 features an ivory leather headband and velour cups with an over ear design to make the user feel relaxed the minute they are on. Light enough at just under 300g, they still feel sturdy and substantial, despite plenty of plastic used in the design. There’s plenty of movement in the cups to fit your head and ears, but once on, everything sits well and feels very comfortable. There’s a little pressure when wearing them, but nothing that would put you off a multi-album session or a movie marathon. With a replaceable three meter cable and main parts, if something goes wrong, the two-year warranty should cover it. Or, you can repair them easily enough, without having to trash them and waste a costly investment. Inside, the Duofol diaphragm speakers provide plenty of bass and depth, with a wide sound field that makes them charming to enjoy. They provide a very balanced sound with clear highs and no distortion of the lows. If they represent a major upgrade to your listening, then you will find sound coming through from all sorts of places and at you in new ways. It can be quite the revelation, and make listening to your music, from quality sources like albums, CDs or lossless digital sources, a revelation. Music sounds natural and stunningly clear, with vocals sounding particularly fine. Classical tracks provide a fine test for them, but they cope with the demands of the relatively modern Peter and the Wolf just as well as they do with the finesse of Liszt’s Piano Concertos. You can also use them for movies and video games, and enjoy a natural sound from the HD 598s, rather than the over-amped whump and whine that dedicated entertainment headphones try to provide. There are a few headphones at higher price points that provide an additional clarity to their sound, but the 598s have a warmth of their own that suits the styling and mature style of the model. The open back design improves the ambient factor to the audio, and improves the look thanks to the grill and wood effect edging. A removeable cable reduces the risk of tangles, knotting and breaking the cable. It locks in place, so won’t come out accidentally and the joints for the cups are strong enough to withstand being knocked off or accidently sat on. The design does have an almost-seventies look to it, which makes them highly esteemed in our eyes, but your own sensibilities might be elsewhere. Even so, they are definitely distinctive from the endless clones and cookie-cutter cans out there. 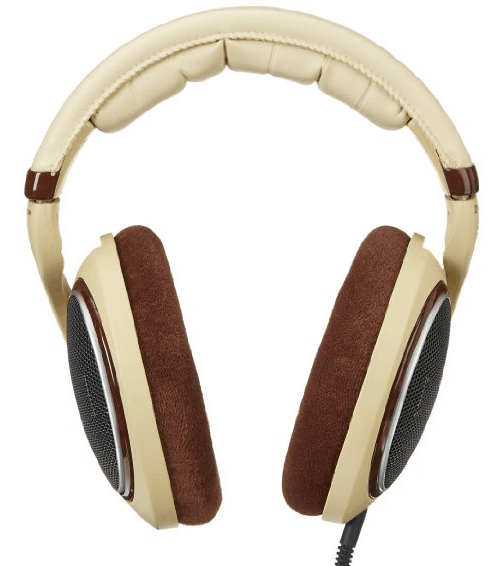 Originally price at around $320, you can pick up a pair of HD 598s from this retailer for roughly half the price. If you’re a price conscious buyer, then there are plenty of less expensive headphones you can acquire with okay sound, but there are few in this price range that deliver the quality of the HD 598. If you demand plenty of value for your money, then you might quibble over the plastic and fake wood, but they don’t affect the audio quality in any noticeable way. If you do want more then the HD 650s are quite a step up at around $450 and you may find they provide a less “fun” sound with their more clinical drivers. The only real negative is that the open backs means you’re not sealed in with your music. That means you might not be popular with the family, and they are definitely not commuting headphones. Also, if that design choice means they’re really for when you’re on your own, then why not just crank up the amp and speakers? That’s a bit of a conundrum that your personal circumstances will dictate. It’s a shame there’s no case provided with them, but there’s a dedicated Sennheiser optional case you can pick up. Our one concern for such a luxury product is that Sennheiser has failed to give them a proper name, sticking with meaningless numerics. Something evocative of old leather, fine wood and the throaty notes of fine music would be “Jaguar.” But, we’re sure you’ll think up your own suggestion. Having come down in price over the years, you’d do well to get hold of a pair of 598s before the vanish from the market. It is worth trying them against other Sennheiser models, or other brands to see which you prefer, but we think these provide a deep and charming level of audio with that is more engaging than many rival models.